Being a prepaid user means that you need to top up your mobile sim with a load every time you run out of it. The easiest way to do that is to go to your nearest sari-sari store and buy there. That is in case you have extra cash to spare. But how about if you do not have any coins and you only have your card with you? I've been using Smart Online Store for quite some time now since I have few coins left from my debit card (which I only use to withdraw Paypal funds). The smallest denomination they have is Php50 (US$1) and the amount is just the same as the load is. It is very convenient and fast. But then I saw that there is a better store that sells load for even a cheaper price. They offer it with 5% off! My mom has been a fan of Lazada.com.ph for years since she started to learn online shopping. 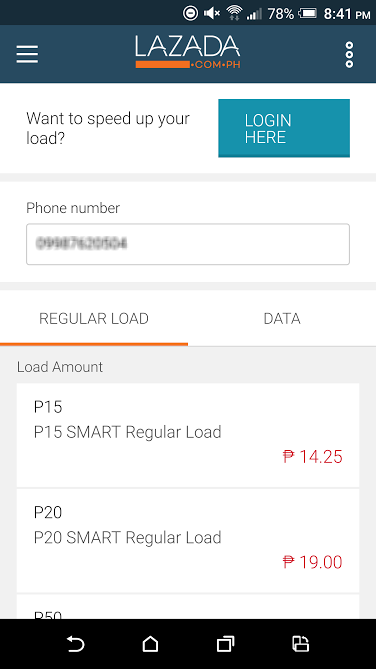 Aside from giving their buyers the opportunity to pay once delivered, they now have online loading services for these service providers, Smart, Globe, Sun and TnT. They accept payment using Mastercard or Visa. You can buy load from them in three simple steps. 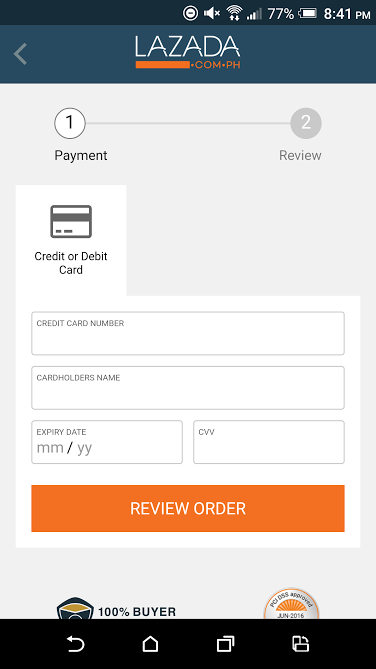 First, you just need to key in your mobile number and select the amount you want to buy. Unlike Smart Online Store, they even have the regular Php15 denomination. After that, just put your card information and pay. 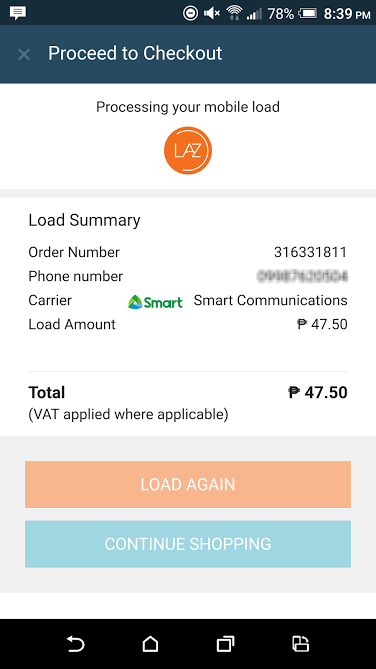 I opted to buy Php50 (US$1) to see how much I can actually save if I use Lazada instead of Smart. From the photo below, I won Php2.5 from Lazada and I can still use it once I need to buy from them again. 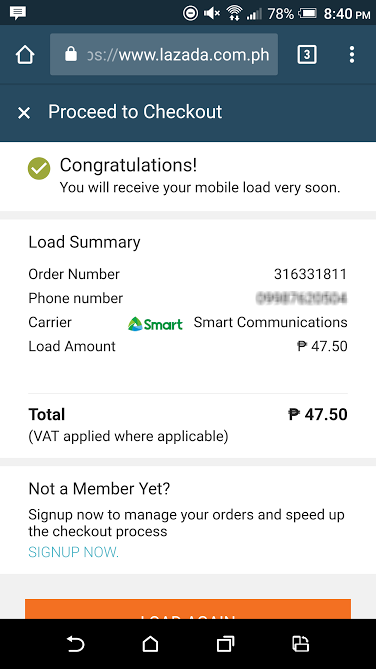 The message icon at the top of my mobile screenshot shows that I received the load that I purchased. It did not even take me that long to process the purchase or to receive the load. I find that this way is easier (web page mobile friendly), and money-wise, thriftier.